Whether you are a professional contractor who does a lot of work clients, or you just love working with wood, your workshop really needs a cabinet saw. Unlike job site and hybrid saws that are portable, these saws are much heavier and designed use in one location. Cabinet saws come with features like a dust collection port, accident prevention and safety features and fencing systems. The cabinet saw available on the market today is the SawStop ICS51230-52 5 HP 230V 60 Hz Cabinet Saw with 52-Inch Industrial T-Glide Fence System, which comes with the longest fence system that you’ll find. Not only is that system easy to use, but it allows you to make different types of cuts and change the orientation or angle of the wood to the blade. A smoothly rotating handwheel on the front of the cabinet turns effortlessly and features an oversize design that will fit any hand. A safety system designed by SawStop ensures that you keep your hands safe because this system causes the blade to stop as soon as the metal touches skin. Another safety feature is the bright red emergency stop button that you can reach with your hand or foot. It comes with a five-horsepower motor and a five-year warranty on the motor. With a riving knife that has a quick release design that makes it easier to change, it’s no wonder that this Powermatic 1792017K Model PM2000 10-Inch 5 HP 1-Phase Table Saw with 50-Inch Accu-Fence and Workbench is so popular with shoppers. That knife also has built-in kickback prevention that will keep your hands safe and help you focus on your work. Though it’s just as sturdy as other cabinet saws, this one comes with a caster system that allows you to move the saw across your shop. When you need to change the blade, you’ll find that this saw comes with an arbor lock that you can unlock with one hand, which lets you change the blade without any special equipment. It uses a poly-v drive belt system that gives the motor extra power, but this belt system also reduces the noise of the motor, which makes it great those working around others. The same fence system that comes on our number one choice, which lets you change the angle of the wood and make various cuts, also comes on this SawStop ICS31230-52 3HP 230V 60Hz Cabinet Saw with 52-Inch Industrial T-Glide Fence System. Designed use in any type of work space, it runs quietly to let you do your work without disrupting others, and it features the same safety system to shut down the saw when it touches any skin. Weighing more than 700 pounds, this is the type of cabinet saw that you can use in the same spot years. This saw comes with a three-horsepower motor that is strong enough most jobs as well as a five-year warranty on that motor. It also features push button controls on the front of the cabinet as well as an emergency stop button. SawStop offers a two-year warranty on the saw itself also. With a three-horsepower motor inside, this SawStop ICS31230-36 3HP 230V 60Hz Cabinet Saw Assembly with 36-Inch Industrial T-Glide Fence System is suitable most of the jobs you have in mind. Its industrial T-Glide fence system lets you make all the cuts you need, and the extension table gives you more room to work too. It also features a system that locks the wood in place to ensure that you make the accurate and completely straight cuts that you need. Other features include two handwheels with measurements around each one that you can use to set up your cuts or as you cut and an emergency button that acts like a kill switch to pull power from the motor during an emergency. This cabinet saw comes with an easy change system changing the blade and a warranty that covers the saw two years and the motor five years. 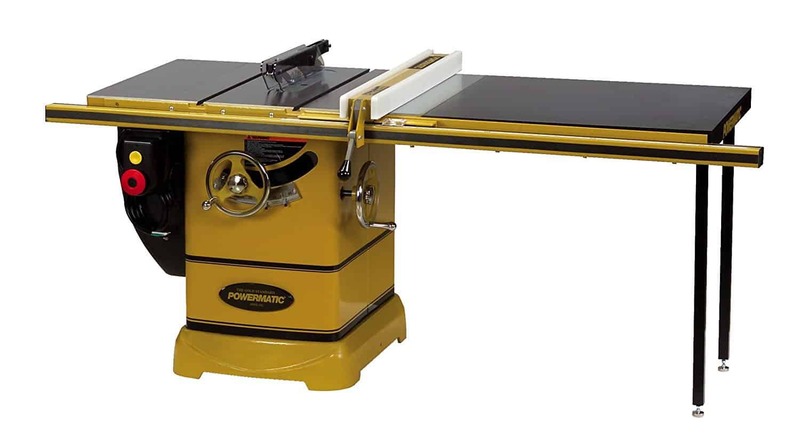 Powermatic is a name that you’ll see a few times on our list of the cabinet saws because this company is responsible so many great models like this 1792010K PM2000, 5HP 1PH Table Saw, with 50-Inch Accu-Fence System. The built-in caster system makes it easy to move the cabinet saw anywhere around your shop with minimal eft, and it comes with a quick release riving knife that reduces vibrations to prevent accidents. At 39-inches high, it also lets you use the saw without stopping over. Its Accu-Fence system, which Powermatic designed its cabinet saws, does a good job of keeping boards and wood sheets at the exact angle or distance that you want cutting, and at 50-inches, this is a longer system than you’ll see on other models. This saw also comes with a five-horsepower motor that features a magnetic switch, which shuts down the motor and keeps it from accidentally turning on. Another good table saw from Powermatic is its 1792006K Model PM2000 5 HP 3-Phase Table Saw with 50-Inch Accu-Fence System and Rout-R-Lift. The dust collection port moves much of the debris you produce away from your work area, but the cabinet itself has a sloped design that makes it easier to get under the cabinet cleaning. Its quick release riving knife not only reduces kickbacks but also reduces the risk of the knife binding. No matter where you use this saw, you’ll like that its poly-v drive belt system allows it to run more quietly, which lets you work without interfering with the work that others do. The saw features a wider trunnion that helps you move the blade into the perfect position. It also features an arbor lock that works like a push button quickly changing its blade. Almost all the features you like about the more expensive SawStop cabinet saws are available in this PCS31230-TGP236 3-HP Professional Cabinet Saw Assembly with 36-Inch Professional T-Glide Fence System, Rails and Extension Table, which costs much less. This model comes in a black finish with accents and features like its emergency stop button in a brighter red color that make those features easy to see. It also features a taller height designed to reduce strain on your back as you saw. The T-Glide fence system that SawStop designed has a lock down feature that actually lets you lock down any board to keep it from moving as you cut. An electrical signal inside the saw blade works with an aluminum brake to send out an instant alert when the blade touches skin to ce the brake to stop that blade. From flexible plywood sheets that move on their own to thick wood boards, this Jet 708677PK XACTASAW Deluxe 5HP Cabinet Saw can help you cut through all types of wood. This saw comes with a riving knife that reduces the risk of binding and kickbacks and has a quick release design to let you use it anytime you need. A left tilt trunnion makes pushing boards and sheets through easier while also giving you the stability that you might need. One feature that makes this Jet cabinet saw a little different is its cabinet, which has an enclosed design that keeps dust away from the motor. It still has a dust collection port that removes much of the dust that you create though. This saw also has an arbor lock that lets you access the blade and remove it with just one touch. The Delta 3 HP Motor 10 in. UNISAW with 52 in. BIESEMEYER Fence System gets its name from the fact that the manufacturer claims you can use this saw to replace all the others that you might use. It comes with a 52-inch fence system that attaches right to the top of the table holding boards and front cranking handwheels that let you extend the opening of the blade. Delta claims that this cabinet saw has the largest opening of all currently available models. Delta designed this table to include a larger surface that gives you more space to work on, and it also comes with a small extension table that juts out from one side to increase your work space. This saw comes with a cast-iron cabinet that reduces vibrations and a tool-less assembly changing the blade. With a quick release riving knife, this Jet 708676PK XACTASAW Deluxe 5HP with 30 In. Rip Fence reduces the risk of binding and also cuts back on the kickbacks that you might otherwise feel. Its five-horsepower motor is one of the most powerful on the market and can make quick cuts in any type of wood. It also comes with a 30-inch rip fence making rip cuts, though you may find that this fence is a little too short your needs. An enclosed cast-iron cabinet serves as the base of the saw and significantly reduces vibrations, and while this base has a sealed design to block out dust, it also has a drawer that slides open storing your tools and equipment. Jet also added a push button arbor lock that protects the blade assembly and a poly-v drive belt system. Depending on how often you work with wood and the type of wood that you use, you may find that this SawStop PCS175-PFA30 1.75-HP Professional Cabinet Saw Assembly is better suited to your needs than some of the company’s more expensive models are. 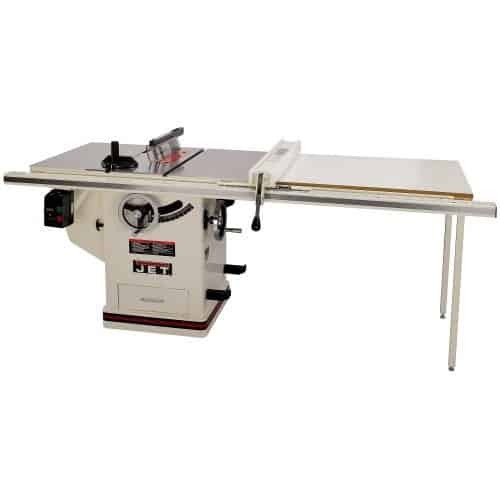 This saw features a smaller base and a shorter extension table that take up less space, but you can use the fencing system to extend the size of the table working with your boards. Though it only has a 1.75-horsepower motor, you’ll find that this motor can handle most cutting jobs and that it does a good job at rip cutting too. Thanks to its lock down and safety features, you can safely use this saw without injuring yourself. This 36-L336 3 HP Unisaw with 36-Inch Biesemeyer Fence System from Delta is another good choice those who want a solid cabinet saw but are hesitant to spend a lot of money on one. It comes with a bi-level dust collection system that collects more of the debris that you create and a trunnion system that lets you make more accurate and precise cuts. Two front cranks have a convenient location just beneath the table to help you make adjustments while working with wood of any type. It also features a bevel gauge that helps you view and make measurements as well as a tool-less blade assembly that allows you to reach and change the blade without using any tools. The 50-inc rip fence that comes with this JET 708675PK XACTASAW Deluxe 3-Horsepower is perfect making rip cuts without worrying about your boards slipping out of the place. This fence system has a lock down feature that will actually lock the board down at the right angle and at the measurement that you choose. It comes with an arbor lock changing the blade and a poly-v drive belt system too. Its cast-iron cabinet has an enclosed design that keeps dust from damaging the three-horsepower motor, but this cabinet has both a dust collection port and a drawer that slides open to reveal hidden storage. Youl’ll also like that it allows you to more smoothly change the position of the blade. Though this Jet 708674PK XACTASAW Deluxe 3HP Cabinet Saw comes with the same three-horsepower motor found on the last cabinet saw, it comes with a shorter 30-inch rip fence that may be a little too short some of your projects. It features all the same great features that made Jet so popular with contractors, including a cast-iron enclosed cabinet that stops dust from entering the motor and a poly-v drive belt system that runs more quietly than other belt systems. Thanks to its quick release riving knife, you’ll never worry about binding or kickbacks, and the enclosed cabinet does a good job of reducing vibrations too. This saw also has a storage drawer in the cabinet and a left tilt trunnion system. Though this SawStop ICS53230-52 5 HP 230V 60 Hz Cabinet Saw with 52-Inch Industrial T-Glide Fence System is the most expensive model made by the company, we moved it to the bottom of our list because other cabinet saws received better reviews from customers. This saw comes with a 52-inch T-Glide fence system that helps you set the size and angle of each cut, and this system has a lockdown feature to keep the wood from moving. A five-horsepower motor makes this saw powerful enough making cuts in even the strongest of woods. Weighing more than 700 pounds, this saw has a durable cabinet that keeps the saw from moving. It also comes with a 10-inch saw blade that has a tool-less assembly. Our selection the top cabinet saw is the SawStop ICS51230-52 5 HP 230V 60 Hz Cabinet Saw with 52-Inch Industrial T-Glide Fence System. SawStop appears on our list a few times because the company makes saws that come with its own patented safety system that causes the blade to stop spinning as soon as it comes into contact with skin. We also like the extended fence system on this model, which accommodate more wood types and board lengths. It also comes with an emergency stop button that you can easily spot during an emergency and hit with any body part available. This model is easily the all types of workers.